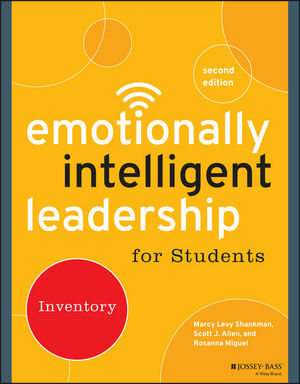 The Emotionally Intelligent Leadership for Students: Inventory is an evidence-based assessment of the capacities of emotionally intelligent leadership (EIL). Research that spans the globe has demonstrated that there is a relationship between emotional intelligence and leadership. For the second edition, the authors have conducted original studies, yielding a substantial revision that better reflects the world of emotionally intelligent leadership and will be transformative for students of all backgrounds. First, this 57-item assessment measures how often students engage in behaviors that align with emotionally intelligent leadership. Then, the reflection portion walks students through the process of analyzing and understanding their results, giving them concrete suggestions for how to explore and improve their emotionally intelligent leadership. Use the inventory along with Emotionally Intelligent Leadership: A Guide for Students and its Student Workbook for an immersive and transformative educational experience. Students will appreciate the opportunity to learn more about themselves as they reflect on their experiences as learners and their own leadership journeys. MARCY LEVY SHANKMAN is vice president for strategy and director of Leadership Cleveland for the Cleveland Leadership Center. SCOTT J. ALLEN is associate professor of management at John Carroll University. ROSANNA MIGUEL is assistant professor of management at John Carroll University.